**Please Click Here to Register! 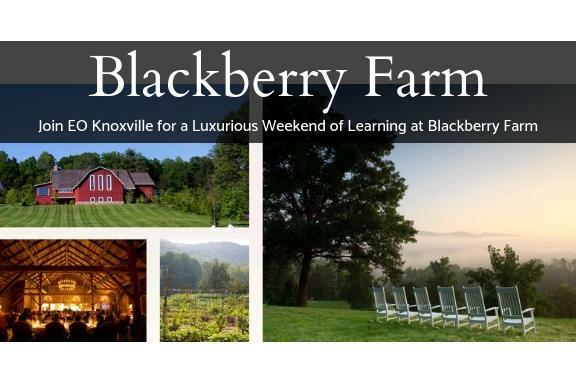 Come learn in the lap of luxury with your Entrepreneurs’ Organization colleagues during our upcoming EO weekend retreat at Blackberry Farm. Mark your calendars for March 1-3, 2019. EO members and their spouses are invited to this MyEO, Knoxville-Tulsa Sister Chapter, and U.S. East Region multi-chapter event at Blackberry Farm, a fabulous five-star resort rated in 2004 by Zagat as the best small hotel in the U.S. The weekend will feature inspiring speakers and group learning sessions in an intimate and exclusive setting. Learning session and meals are included, and a block of rooms consisting of Estate rooms and Holly Glade Cottage suites are available at our negotiated discount rate; sleeping rooms are not included in the EO event ticket cost. The group rate will save up to $100 off per night ranging from USD $1,045 to $1,495. Forum and Chapters may also have an opportunity to rent a private multi-bedroom residence for the weekend. Please inquire with Blackberry Farm. Group pricing is available through Friday, November 2, 2018. For reservations or inquiries, contact Blackberry Farm directly at: salesgroup@blackberryfarm.com or by calling (844) 718-5034. Please email EO Knoxville events team with any additonal questions.